New Delhi : CPI(M) leader VS Achuthanandan had described Congress President Rahul Gandhi as 'Amul Baby' way back in 2011 assembly election, meant to convey as someone who was immature and inexperienced. On Monday, the 95-year-old leader repeated the same charges against Rahul Gandhi, who was announced as the Congress candidate from Wayanad parliamentary constituency. "Once I had mocked Rahul Gandhi by calling him an ‘Amul baby’. I meant it then. I called him so because he approached the changes in Indian politics without understanding them and took decisions in an emotional, childish manner. 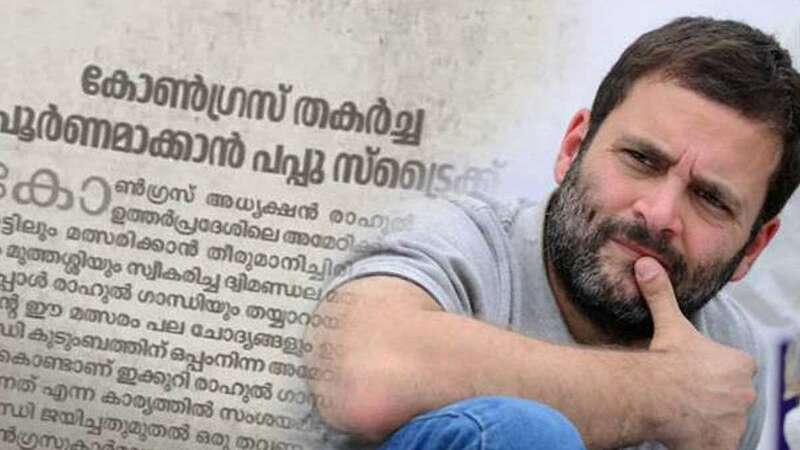 Rahul Gandhi, who approaches middle age now, does not seem to have undergone any changes even today," the CPI(M) leader wrote on the social media site. Achuthanandan, currently the chairman of the Administrative Reforms Commission, also lashed out at the Congress chief for relying on the advice of leaders like AK Antony and Ramesh Chennithala and making the mistake of taking on the LDF in Wayanad. "He’s behaving like a child who gets muddled on the advice of others and is unable to make informed decisions…he has the intelligence of a child who chops the branch he’s sitting on. That’s why I called him an Amul baby then. It’s still relevant today," he said.